Some California native plants, such as our brilliant orange poppies, bring instant recognition. 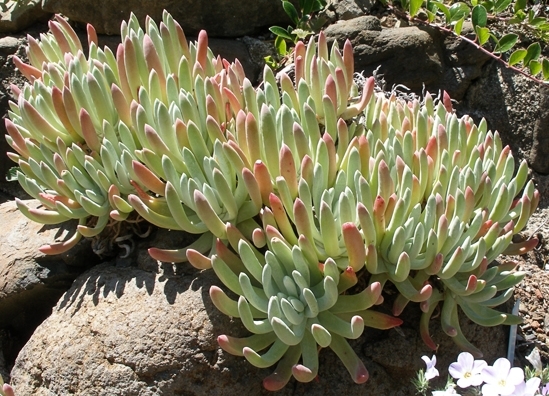 Less well-known are our native succulents, the Dudleyas. Mostly found on coastal bluffs and rocky outcroppings throughout California, these highly drought-tolerant plants offer great hummingbird forage with their little bell-shaped flowers atop tall, fleshy stalks. Dudleyas come in two forms: branching and unbranching. Branching dudleyas tend to form spreading colonies and are best used as ground covers in the garden. Unbranching types form large rosettes and are great as focal points. Both kinds like containers and have a long life span, living 50-100 years, given the right conditions. They are perfect for rock retaining wall crevices, as this is how they naturally grow. Chalk liveforever (Dudleya pulverulenta): 12” – 24” rosette with a thick, farinose coating. Although most succulents require little irrigation, many come from desert climates where there is a winter and summer “wet” season. Unlike the desert succulents you typically find in nurseries, native Dudleyas evolved in our summer-dry Mediterranean climate, and often lack resistance to pathogens associated with summer moisture. This is is why Dudleyas are best combined with other plants that also dislike summer irrigation, such as Coyote mint (Monardella villosa), St. Catherine's lace (Eriogonum giganteum), Purple needlegrass (Stipa pulchra), or Chaparral currant (Ribes malvaceum). Dudleyas are easy to care for, given the right conditions. Flower stalks can be removed when bloom is over. Either wait until they are dry enough to pull away easily or cut with pruning shears to avoid accidentally uprooting the entire plant. Resist removing all of the old, dry leaves, as these help stabilize larger single-rosette types (a long, exposed stem is easy to knock over). Soggy soil can be a problem for Dudleyas, so provide good drainage and plant so that they are tilted sideways, allowing water to run off. If planted in clay soil, avoid watering in the summer; in sandy soils, some summer water is OK. They will naturally die back at the end of summer without irrigation, often turing red as the foliage desiccates, before regenerating when fall and winter rains begin. Avoid trying to circumvent this natural cycle with extra irrigation, as it may shorten their life span by increasing their susceptibility to root rots. You can also prevent root rots and fungus problems by mulching with gravel and avoiding organic materials such as bark.